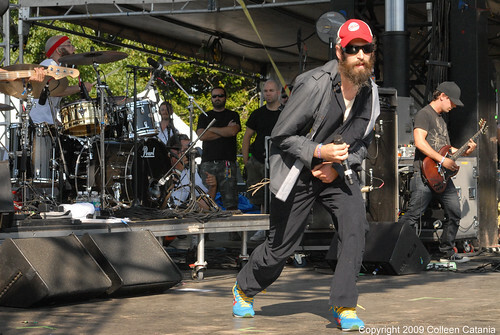 A few hours later, it was time to enter the holy realm of bearded and baseball-capped Hasidic Jewish rapper Matisyahu. He dropped my jaw instantly with his awe-inspiring beat boxing performance using his mouth as a nimble multi-instrument to bridge together a set of spiritual transcendence. Everyone in the crowd seemed to be lifted up off the ground in some way — even the naked couple who danced freely in the afternoon sun and wore only large grins and fuzz patches. As Matisyahu continued to play tracks from his forthcoming album Light, those festivalgoers who saw the couple watched with a sense of awkward pleasure and a sense of deviant and peculiar enjoyment. The couple seemed like a stark contrast to Matisyahu’s worshipful performance. But when I thought about it, I wondered if we were actually getting an unexpected insight into what it might have looked like to see the Bible’s King David dance around in just a skimpy loincloth entranced and praising the Lord. Such was my experience seeing American Hasidic Jewish reagge/beatboxer Matisyahu at Rothbury a few months back at Rothbury. It was a concert performance I’ve told many people about. And there’s one thing I’ve always comes up when I talk with music fans about Matisyahu: the difference of energy between his album and live show. And the show that most people reference is his second recorded album was his “Live at Stubbs” in Austin, TX. That recording is vintage Matisyahu live. But after listening to him progress over the last few albums, and after soaking up his latest album “Light”, I think he’s found a way to inject the massive amounts of energy and heart of his live show in to his recording process. I’ll be seeing Matisyahu tonight at the House of Blues in Chicago. I don’t expect to see any naked dancing couples this time around, but I do expect to experience Matisyahu evoke the heavens with his deeply spiritual mix of reggae, dub, rock, hip hop and beatboxing. Be sure to check out the video below from Everything about Matisyahu, it’s a pretty funny way to get to know Matisyahu as he interviews himself on a beach. Have you seen Matisyahu live before? What you do think of artists who are great live but don’t have the same energy on record? This was a great show but I really don’t like seeing shows at the House of Blues because their are to many blind spots. Even on the main floor I could not see the stage. They should limit the admittance to make it a more intimate concert.